Slowly but surely the GC clan has been switching to Crank Brothers pedals. Ever the trendsetter, J-Vicious was the first in the group to ride with the Egg Beater. Next, I switched after test riding the pedals at Interbike this past fall. And finally, Dr. P got himself a pair because...well, everyone else did! Actually, the fact that a few of us regular riding buddies are now riding the same pedals has considerable group benefits. Interchanging bikes during a ride just to give a new obstacle a try with a different bike is now possible. Also, it makes borrowing bikes a lot easier and has led to an extension beyond ones own bike stable to having a group stable (although, Dr. P may not see this as a benefit as we all seem to be borrowing his bikes). Egg Beater pedals were designed with simplicity in mind. Made primarily for the cross-country rider, these pedals are designed to shed mud and shave weight. They also serve as the base for most of Crank Brothers' other pedal lines including Candy (all mountain), Mallet (downhill), and Quattro (road). Only the new 5050 flat pedal - designed for downhill and freeride - deviates from the egg beater design. Unlike Shimano SPD or other pedals there are no tension settings with which to fool. To engage simply step down on the pedal; the wings of the pedal will spread and hook onto the cleat of your shoe. This is much more of a downward motion compared with the more forward motion required of an SPD style pedal. Once you have engaged you will not be able to lift your foot vertically out of the pedal. This is because the wings engage more tightly over your cleats on the upstroke of your pedal motion. The only way out of the pedal is with a sideways motion. Theoretically this is true for SPD and other pedals as well, however, when the tension settings are set too loose on such pedals your foot will often slip out of the pedal as you apply excess upward force - as when you are trying to crest a difficult climb. You can set the release angle of the Egg Beater to either fifteen or twenty degrees based on your preference. Once again there is a simple solution for this setting. To change the release angle, simply reverse the direction of the cleat on the bottom of your shoe. Another advantage of the egg beater design versus other pedals is the fact that there are four entry points instead of two. With my old SPD pedals I would often have to level the pedal before engaging by pushing the pedal forward with my toe. Not too big of a deal, but when you are trying to restart on a hill and need to build momentum immediately you want to snap in quickly with having to think. Now what about the legendary mud clearing capabilities you have heard so much about? Is this reality or hype? As one who rides on the east coast and whose "home" trails still have significant mud even during a drought, I can tell you that I have never had to stop and clear mud from my shoes before re-engaging into the Egg Beaters. One negative aspect of the design is that as you put downward pressure on the pedal the wings spread ever so slightly. They tighten up as you go around with the pedal, however, there is just a nano-second that feels as if you are not fully integrated into the pedals. This problem is likely alleviated with the Crank Brothers Candy pedals as they have a small platform that will absorb the force of your pedaling before the wings begin to spread. My problem with the Candy is that a shim is needed for the cleat with most cross-country shoes because of the platform. If you decide to go with the Candy make sure you find shoes with a very open tread design so that the shim is not necessary. Also, be careful with the chromoly version of the pedal as they appear to be the weakest and most prone to breakage. Most of the negative reviews of the chrome pedal on MTBR mentioned breakage or failure of some sort. It would appear that the chromoly version of the pedal is best used for light trail riding or commuting. 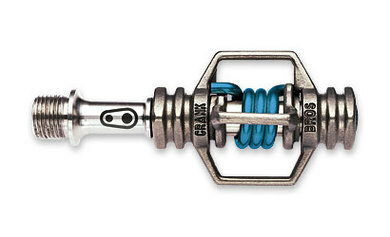 For 2006 Crank Brothers makes five versions of the Egg Beater pedal. They all function similarly, however, they differ in material, weight, and price. For my money the SL represents the best strength to weight to value ratio. When it comes to both pedals and shoes I subscribe to the idea that the less you think about them the better they are. Although most agree that the Egg Beater aesthetic is visually appealing, the real beauty is the "don't make me think!" design.